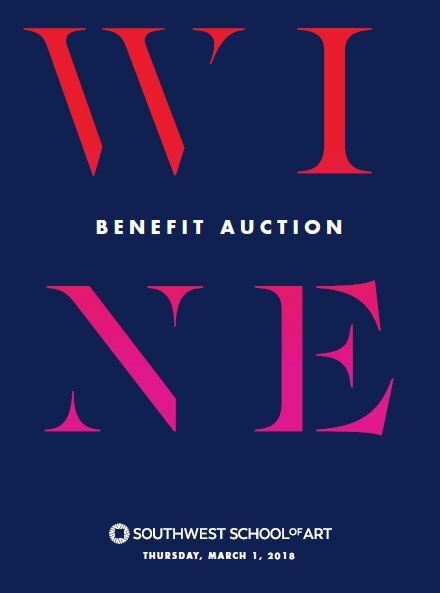 Join us for our annual Benefit Wine Auction and enjoy a high-energy night of Live and Silent Auctions featuring rare and classic vintages and exceptional wine-oriented travel and chef-inspired culinary prizes. Throughout the evening, you will have the opportunity to bid on fabulous prize packages, with wine expert, Sean Elliott once again serving as co- auctioneer. All proceeds from the event go towards scholarships for deserving students in our BFA degree program! Tickets are $150 per person or $275 per couple. For more information or to purchase tickets by phone, please contact Stephanie Peché Canales. Lots will be offered to bidders during the Live Auction by co-auctioneers Sean Elliot and Rob Vogt. Click here or the image below to view the Wine Auction catalog. Southwest School of Art warmly thanks all of the many donors who have given to the Wine Auction.